Your cakes taste good. It is okay if they are not as pretty as someone elses cakes. You really want your cakes to be the centerpiece of the dessert table. You want people to Ooh and Aah when they see your cakes. So what are you doing wrong? You get the same icing as everyone else. Maybe icing the cake to look pretty is just not your forte. You avoid icing a cake, because you know it will not be pretty when you are done. And cupcakes, well you can just forget cupcakes. 1 - do not you wish sometimes you could decorate and cake to give to someone special on their birthday? 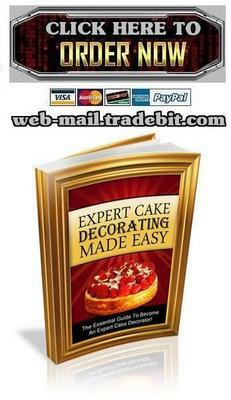 2 - Are you tired of buying bakery cakes and wishing you could do that yourself? 3 - Decorating cookies can be just as frustrating and with the holidays every year. Would not you like to make something that did not just taste good, but looked good too? 4 - Have you tried using a pastry bag? 5 - They say it is so easy! Was it easy for you? 6 - How many times have you ended up with icing all over the place and the icing on the cookie or the cake still looked bad? 7 - Have you ever tried using a plastic bag by snipping the end off? I do not know about you, but it did not work so well for me either. Over the years I have heard a couple of tips. What I did not know is that I was not getting all of the tip! Id try their tips, but they never worked for me. Then a friend of mine suggested taking a cake-decorating course being offered by our local hobby and craft store. Since I was not doing anything, I thought I would go check it out. My life has not been the same since. My cakes look wonderful and after taking a few more of the advanced decorating classes I am much better at decorating than I was. Instead of avoiding baking cakes to ice, now I make excuses to bake cakes just so I can practice more on my decorating skills. My husband is complaining about the weigh he is putting on and I tell him to go work it off. To be honest, he loves my cakes now better than before. I have only taken a basic class and I am ready for them to start signing people up for the next class. I have found there are even other classes I can take. I started looking online and I found a place close to me offering these types of classes. As I looked even more online, I found there are web sites giving you step-by-step instructions to making some of these things. That might be great for some, but for me I need to watch someone do it. Then one day it hit me. If I could compile everything I have found on the web and place at peoples fingertips, they will have an easier time find information than I did. So That is what I did. I am on my way to being an expert cake decorator and you can too. Find the classes or the type of instruction which ever works best for you and get started just like I did and in no time you will be decorating cake and cookies like a pro! I can guarantee you will love it and be ready when It is over for the next class. You will want to learn more and more. The classes are fun, the instructors are helpful and the other students are all in the same boat you are in. Most of them ca not ice a cake either or they would not be there. Okay now you have decided to take a class, Where are you going to take a class? This is where my book comes in handy. It has schools listed in it, the classes they offer and what they cover in their classes. Most schools are similar, but they all are a little different when it comes to their curriculum. If you do not like the classroom setting, then you can find a course you can take online. The biggest difference between the two is the size of the class and the tools and supplies. In the classroom setting, the school will supply most of the tools and supplies you will need. At home of course you will have to furnish everything. You will want to have your own tools anyway, so investing in them before you take a class is not a bad idea! Plus once you have invest in the tools you will not want them to sit around collecting dust so put them to good use by taking a class. Whether it is online or in a classroom setting. Just like you I had all but given up on trying to put icing on cakes, cookies, and cupcakes. I just could not do it where it did not make a mess and the more I smoothed the icing on the cake the more of a mess it looked. I decided I would never learn how to make things look good, but at least I could make them taste good. That worked pretty well for a while. Every time I found a good recipe I wanted to try, but I knew it would not look like the picture when I got through with it. 1) This new hobby may be more than just a hobby to you. You may decide to start your own business making and decorating lovely cakes for those who do not have the time or the knowledge. * You would not have to spend a lot of time search the Internet looking for the information. This book will save you the time and energy of looking at everything on the Internet only to find out it is not what you are looking for. With this book you will know what the website has to offer so you do not have to waste time. I know how much time it takes to find anything on the internet. There are probably a lot of slow moving computers and if you end up in the wrong place it may have seemed to take you forever to get to. Getting to the right place will end up taking you twice as long. I know we all have better things to do than to sit in front of a computer screen all day waiting on the website to come up. If you are planning on looking at more than just one or two websites and taking into account a couple of wrong turns on the way, you have wasted you whole day and have nothing to show for it. You ca not take a class if you are still looking it up online. The amount of money you will spend on this ebook will save you more than that if you will start looking at your time as money. How much are you worth? If your time is anything like mine and I think it is, your time is worth more than $4.99! You will save that much money by not having to spend it all on your computer.